I was always interested in meeting my father. The last time I saw him, I was three years old. I decided to reflect this idea using photography. I do not remember what he looked like, and I do not have any image of him in my memory, but rather I try to “find” him by means of photography, to create memories which I never had — memories about family with my father. She met my father in Sochi. It was a “resort affair” quickly led to marriage. She did not know much about him, only that he was a captain and worked somewhere in Northern Russia. They never lived together. He usually came for a few weeks and then disappeared. At some point my mother found out that he had another wife and child. She could never forgive him and soon they divorced. In her photo albums there were almost no photos left of my father — not only did she divorce him, but she also destroyed all the photos of him including those from their wedding day. However, I was able to find a few images from an old black and white passport photo machine. They were together in these photos, however one cannot really see his face: the images are quite small and he always wears aviator glasses. He looked like a young Belmondo. In these images they are joking together, kissing each other and they smile a lot. One of these photos I kept for myself. My mother never liked this and tried to find out why I wanted to have his photo for a long time; since then I have kept it in my wallet. Really, what do I need this photo for? Sometimes I just want to look at it and imagine that my father, although I never met him, was as beautiful as Belmondo. On some occasions I proudly show this photo to friends (“My parents in 70s”). Even if this photo had never existed, I would have created it in Photoshop. This project is very personal, somewhere between a documentary and fiction, where the dreams of my mother are real, but the memory I created for myself based upon her dreams are fictional. I used in the project old photos from the album of my mother and reconstructed our new memory “with the father” using the portraits of movie stars from the 70s. Natalya Reznik was born in Perm (Russia). She studied design, then took part in several workshops organised by Fotodepartament in St-Petersburg, by Objective Reality Foundation, by Ostkreuz Agency and Neue Schule fuer Fotografie in Berlin etc. In her projects she reflects political and social issues of Soviet and Post-soviet Russia (immigration, problems of elderly people, politics of Russia in the Soviet time) and her personal and family problems. Since 2013 Natalya has been teaching photography online at the Fotodepartament Foundation. Besides her practical activity, she works as an art critic and writes texts on photography (Calvert Journal, photographer.ru, Urbanautica etc). In 2014 Natalya published her first photo book “Secrets” reflecting her own experience of immigration. 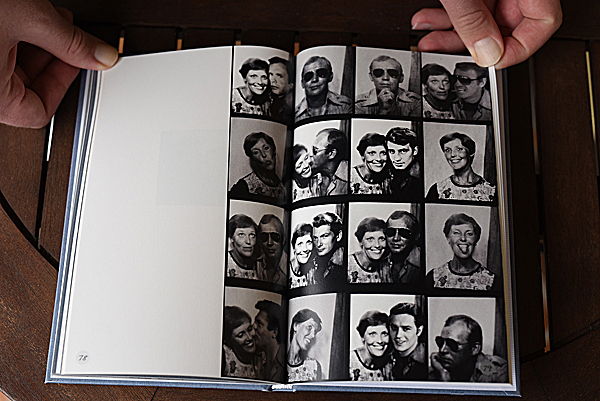 The book was selected for several international festivals and photo book shows. Her second photo book “Looking for my father” was self-published in November 2016.